Nokia Mobile announced three interesting devices in this month – a midrange Nokia 7.1, a higher midrange Nokia X7 and a lower end Nokia 3.1 Plus. The devices target different markets at different price point, but one price point Nokia Mobile still hasn’t covered is the ultra premium market. By ultra premium I mean the 1000 euro device that could compete with Apple’s iPhone XS, Sasmungs Note, Huawei’s Mate, etc. We could see a competitive device in this segment with the upcoming Nokia 9, rumored to feature a penta-lens camera setup, but we are not sure if the 9 will appear by the end of this year or next year at MWC. A sign that another “flagship” may be in works at HMD Global is the recent entery to Geekbench. 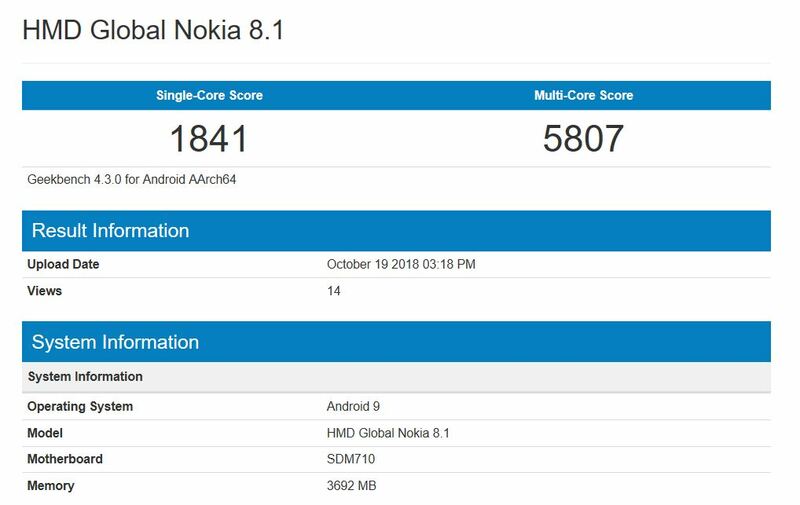 Nokia 8.1 running Android 9 Pie, and using Snapdragon 710 with 4GB of RAM was spotted there. The Nokia 8 launched around this time last year, so we shouldn’t be surprised hearing about an 8.1 this year. The SoC the Nokia 8.1 allegedly uses suggest that the device will be a type of an “affordable flagship”, probably below the 600 euro price tag, just like the Nokia 8 was, but the 8 then featured a flagship level SoC, while the Snapdragon 710 is the second best what Qualcomm offers. Hopefully we will get a new higher end device from Nokia Mobile on a global level by the end of the year.